The BL352IRW is the perfect choice for simple security applications. It is affordable yet equipped. 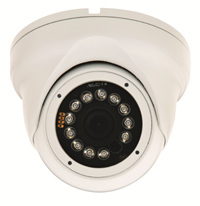 The BL352IRW is a vandal and weather-resistant 3-axis ball camera that offers a wide angle fixed lens for general viewing applications and a 1/3″ CCD chipset for sharp and clear images. It promises excellent color sensitivity and high resolution for both day and night applications, and its compact size and simple mounting device also makes installation quick and easy. This ball camera was designed to satisfy your cost-sensitive security purposes.